In our previous blog post, Brigitte Bönisch-Brednich noted that her resolution for 2017 is to read six ethnographies. Inspired by this and all the different ethnographies we in the Cultural Anthropology Programme at Victoria University of Wellington are reading, we have started an ethnography book club on GoodReads. The goal is to read and discuss an ethnography every two months. If any of you are interested in ethnography (students, anthropologists, writers), we invite you to join us! The plan is for Cultural Anthropology staff to select an ethnography, and the group to read it over the two-month period, meeting to discuss it during the last week of the second month at VUW. We’ll post some questions to get started in thinking about the book, and where possible we’ll also invite the authors to join us in our online conversations. Earlier this year I participated in an online writing group for anthropologists run by Savage Minds. I didn’t achieve all of my writing goals but I did enjoy reading the series of interviews Savage Minds bloggers published with various anthropologists, including one with Kirin Narayan on ethnographic writing. 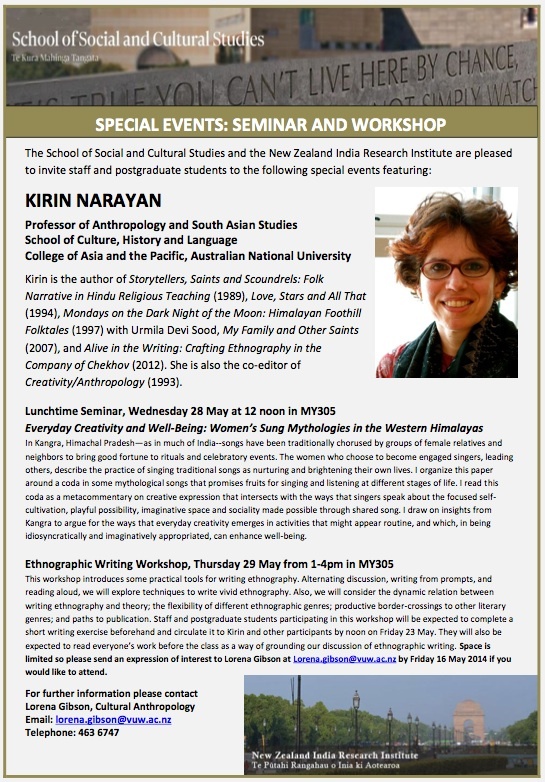 I have long been a fan of Kirin’s work and when I saw that she is now in the School of Culture, History and Language at Australian National University (much closer to New Zealand than the United States) I decided to invite her here to speak about her research. She accepted! 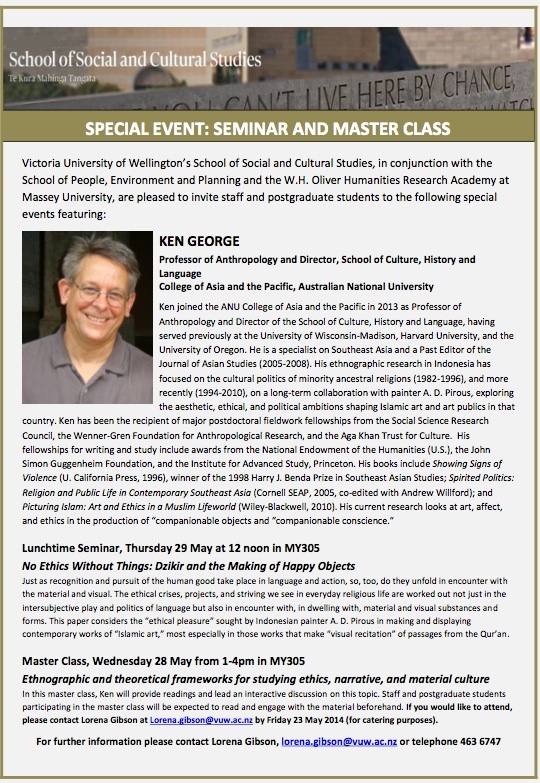 Next week she and Ken George will be giving seminars and running workshops/master classes on various aspects of their research at both Massey University in Palmerston North, and Victoria University of Wellington. Details of the Wellington events are below. Writing Projects: a film review, a book review, a book chapter, and a journal article. Goals: To devote one day per week to specifically to writing, and to write for at least one Pomodoro (25 mins) on other days. And to get these writing projects finished!